It all started one seemingly ordinary night while at a bar enjoying drinks. 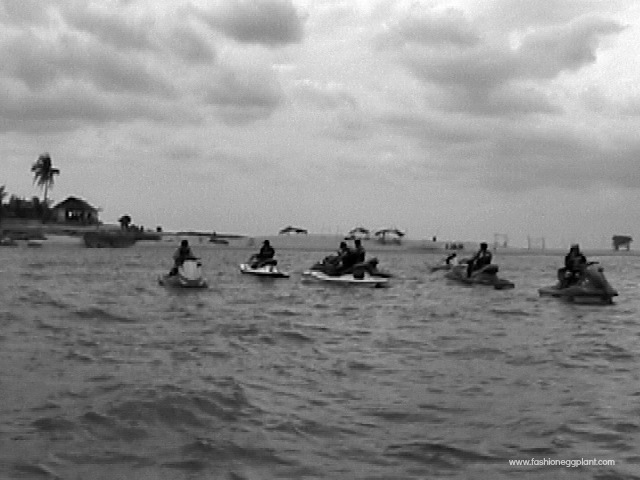 We were all jet ski hobbyists by then spending most of our weekends riding around Taal Lake but none of us have ever attempted a cross-island trip. Like most people, we would normally have our cars tow the ski’s until our final destination and from there disembark and ride around to our hearts delight. We always saw it as a big sort of toy, never a proper and acceptable mode of transportation…until that day. I didn’t think much of it at first. I thought it was just one of those things you plan and get all excited about while drinking and then forget the following day. But I guess it was just too much of an adventure to resist because soon after, I received a text from my friend asking if I wanted in. It took me awhile to reply because a) it would mean travelling alone as the sole female with a bunch of men b) being a castaway wasn’t exactly in my immediate plans and c) I didn’t know how to swim and this time, it wouldn’t be just about a lake, I would have to conquer miles and miles of open water. After much deliberation, I finally said yes. I knew in my heart that this was a once in a lifetime opportunity I couldn’t possibly pass up. Everybody felt the same way because soon after, rigorous training began and plans started pouring in. Fridays meant going to bed early in preparation for a lengthy Saturday that would be spent back on the lake, but this time, it wasn’t just for fun but to prepare ourselves for the long arduous journey we had ahead of us. There was one instance during an afternoon of training that my hands and legs cramped up so much from being constantly wet and overworked that I couldn’t grip the throttle anymore. I didn’t have my cell phone on me then so I couldn’t call anyone to tell them something was wrong. All I could do was wait until somebody noticed I was missing and trackback to find me. I didn’t have to wait that long then but I learned a valuable lesson: I needed to be able to pace myself if I wanted to do this but more importantly, to buy a dry bag for my phone and to always have it on me no matter what. Getting stranded on the lake scared the bejesus out of me but it wasn’t enough for me to back out. If anything, it probably even drove me to work harder and prove myself to a bunch of testosterone driven males. After several weeks of planning and logistics, the day of our departure finally arrived. We made our way bright and early to the port of Lucena in Quezon where a Boston Whaler carrying our extra gasoline and supplies was waiting. This would mark the beginning of our record-breaking journey. By now, everyone was in high spirits. 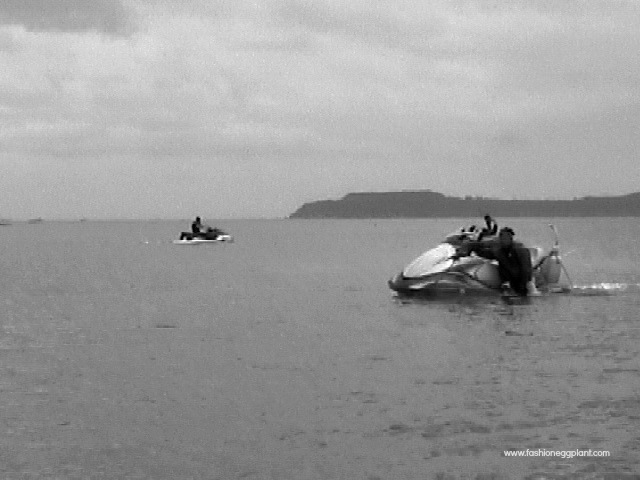 The excitement of what we were about to accomplish was overwhelming, we couldn’t wait to hit the open water. Unfortunately, the boatmen were having trouble with the whaler. Our boat refused to accelerate speed. An hour passed and the mechanic was still working on the problem. Frustrated, we finally asked him how much longer it was going to take. According to him, it would be done in a matter of minutes. With that in mind, we decided to split into two groups. The first group would wait until repairs were done while the second would get a headstart. We were to rendesvous on an agreed island via GPS for lunch. I was part of the second group and couldn’t be happier. As I put on my lifevest and slipped the key into the ignition, a wave of exhilaration unlike any I have ever felt washed over me. This was it. 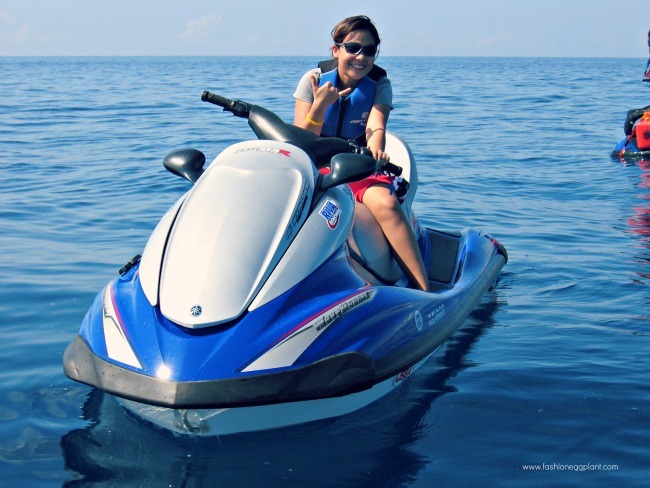 I was going to be recorded as part of the first ever group to travel to Boracay solely on jetskis and I couldn’t believe my luck. More over, I was the only girl and the first ever female to do it. Now I finally understood what it meant to be truly ‘stoked’. After a couple of hours, we finally made it to the island. It was tiny, barely inhabited and shaped like a key with a sandbar that extended as long as a block and as wide as four cars parked side by side. It was perfect. It was private, it was ours. I imagine it was the same way Magellan felt when he first stepped foot on our shores. Our little island was in the middle of nowhere, a definite beauty with its crystal clear waters and a very gradual shoreline. It was barren aside from a little hut perched right in the middle of it. A great place to relax and gain back our strength after hours on the ski. It was nearing noon by then and our stomachs were beginning to grumble but still, no sign of the boat. We’ve been waiting on the island for over an hour and we were starting to get worried. Our fate lay in that boat getting fixed. We didn’t have enough gas to make it back and our food supply was low and consisted only of a pomelo and a pack of pan de sal. Good thing we all had our phones with us this time, working and dry in their respective cases. 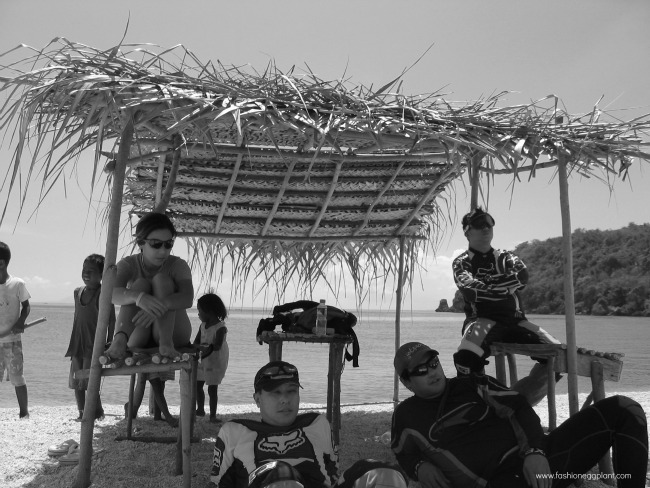 A few months before our trip, I switched to sun cellular because of their reasonable rates and that afternoon, while stranded on the island, I couldn’t have been happier about my choice. I was the only one with a decent signal that could get through. After making the call, I found out that the rest of our group was on their way and would arrive within thirty minutes. You can’t imagine what a relief it was for us to know that fresh drinkable water and a warm decent meal was finally on it’s way. 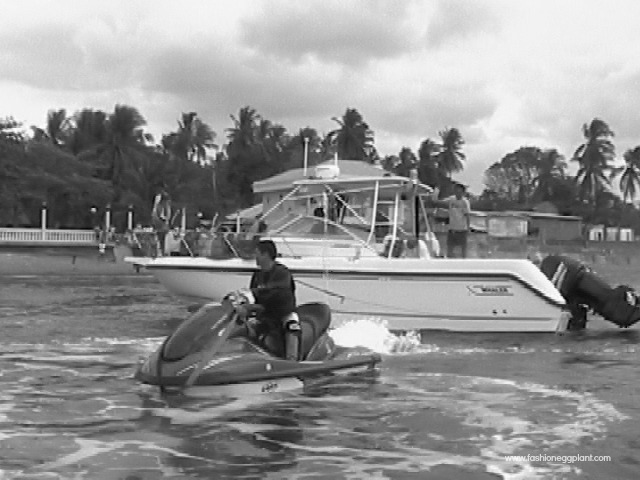 With our boat working magnificently and our group intact, we were finally able to drive the last few miles to Boracay together without further incident. The entire voyage took us about nine hours to complete. Along the way, we saw schools upon schools of tiny jellyfish in every color you can imagine (they looked almost like jell-o), several adorable dolphins that took the time to frolick around us, and a shark which swam so beautifully alongside our skis it was almost hypnotizing. It was nature in its purest form, nature that you only get to experience during trips like these. It’s been 7 years since then and all I can think about as I type this is how pleased and proud I am of myself for sticking to my guns and going through the entire ordeal despite its many setbacks. The bond created among individuals during times of trial are strong and irreplicable. With the right amount of passion, perseverance and determination, no goal is impossible to achieve, we can do anything. Want to go on an epic journey with your barkada as well??? 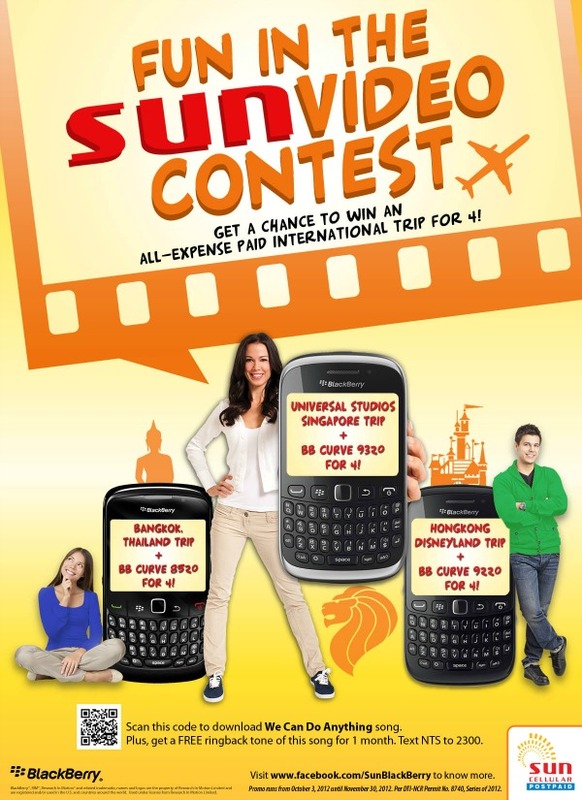 Then enter SUN Cellular’s Fun In The Sun Video Contest where you and your barkada get the chance to win 4 Blackberry phones and an ultimate dream vacation for four. Make sure to creatively incorporate all Sun Blackberry features such as unlimited Sun calls and texts, BBM, mobile internet and social networking. Don’t have a video cam? No problem. There are Sun Blackberry video booths set up in selected areas where you and your friends can make an on-the-spot video. #YOLO isn’t such a cliché anymore when you’re living it. Now is not the time to hesitate, go gather your friends and start making that video!!! You already! I really like girls na one of the boys & I'm starting to like you already as a person. I'm your official fan na. Haha :) chos! Wow, you guys really enjoy that awesome vacation. Wish to experience that also.